Wednesday's trading session was pretty uneventful compared to Friday's, Monday's and Tuesday's volatility. Stocks fluctuated along their Tuesday's closing prices, as investors hesitated after slightly better-than-expected Final GDP number release. Will stocks rebound today? Or is this just a consolidation before another leg lower? It seems that there are still two possible future scenarios. The main U.S. stock market indexes were mixed between -0.9% and -0.0% on Wednesday, as investors hesitated following Tuesday's sell-off. The sentiment remained pretty bearish despite some better-than-expected economic data releases. The S&P 500 index fluctuated along the level of 2,600. It is currently 9.4% below January 26 record high of 2,872.87. The Dow Jones Industrial Average lost just 0.05%, and the technology Nasdaq Composite lost 0.9% on Wednesday, following its Tuesday's sell-off of 3.3%. The nearest important level of resistance of the S&P 500 index is at around 2,630-2,635, marked by yesterday's daily high The next resistance level remains at 2,650-2,670, marked by previous consolidation and short-term local highs. The resistance level is also at 2,690-2,710, marked by March 22 daily gap down of 2,695.68-2,709.79. On the other hand, the nearest important support level is at 2,585-2,600, marked by recent local lows. The index futures contracts trade 0.3-0.6% higher vs. their yesterday's closing prices, so expectations before the opening of today's trading session are positive. The European stock market indexes have gained 0.4-0.8% so far. Investors will wait for some economic data announcements today: Personal Income, Personal Spending, Initial Claims at 8:30 a.m., Chicago PMI at 9:45 a.m., Michigan Sentiment number at 10:00 a.m. The market will probably extend its short-term consolidation, but the volatility may come down after yesterday's sideways action and ahead of long holiday weekend. 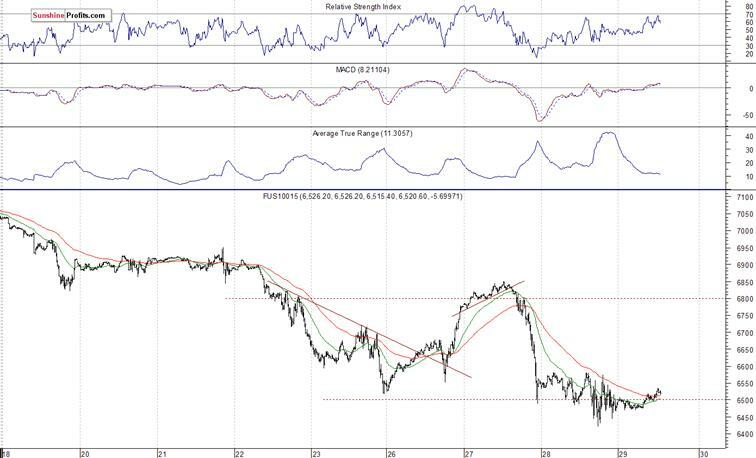 However, if the index breaks lower, it could continue towards February 9 low of 2,532.69. Concluding, the S&P 500 index may extend its short-term consolidation and continue to fluctuate above support level of 2,600. 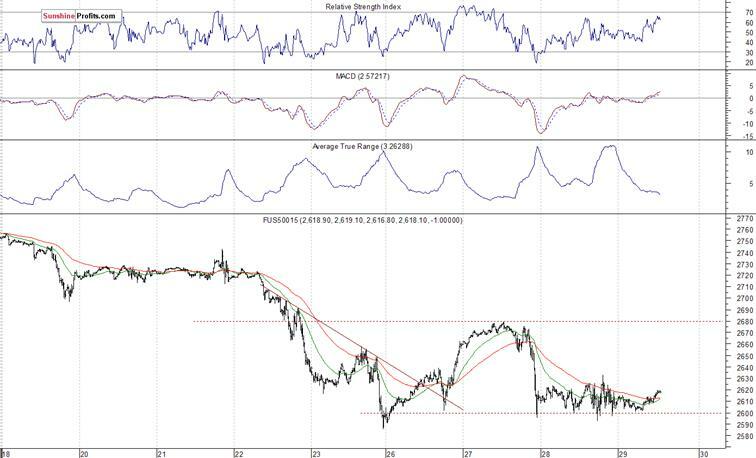 We may see a lower volatility following Friday's, Monday's and Tuesday's wild swings. Investors will probably step back ahead of long holiday weekend, month's, quarter's end. However, bulls continue to walk on thin ice here, as some more downward pressure may lead stocks to their early February low. The early March rally failed to continue following monetary policy tightening, trade war fears, negative political news. What was just profit-taking action, quickly became a meaningful downward reversal. 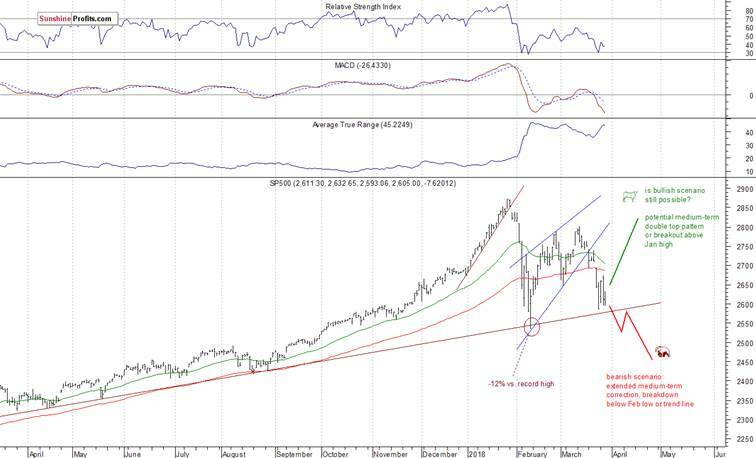 Last week's Monday's sell-off and breakdown below over-month-long rising wedge pattern made medium-term bearish case more likely, and after some quick consolidation, the index accelerated lower on Thursday and Friday. Just like we wrote in our several Stocks Trading Alerts, the early February sell-off set the negative tone for weeks or months to come.